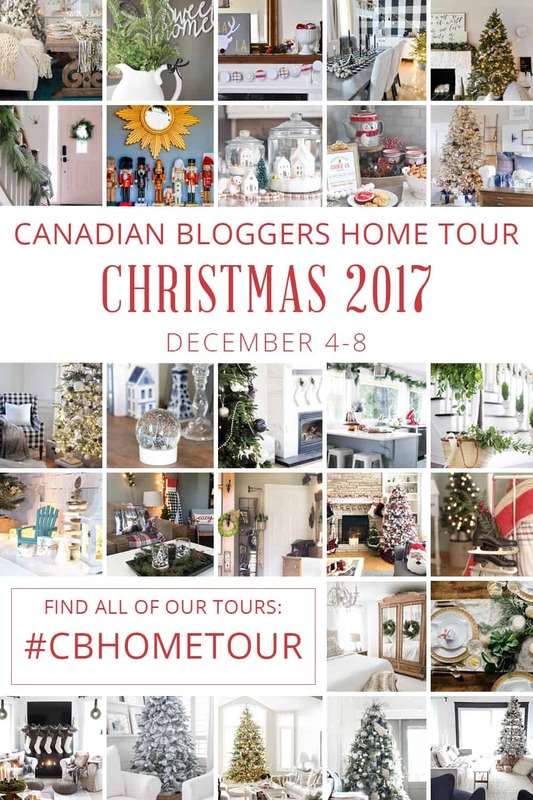 I’m so excited to be sharing my home with you today for the Canadian Bloggers Christmas Home Tour. This is one of my favourite tours of the year. If you’re stopping by from one of the other houses, welcome! My name is Dannyelle and I live just outside of Toronto with my husband and two girls, aged 10 and 13. 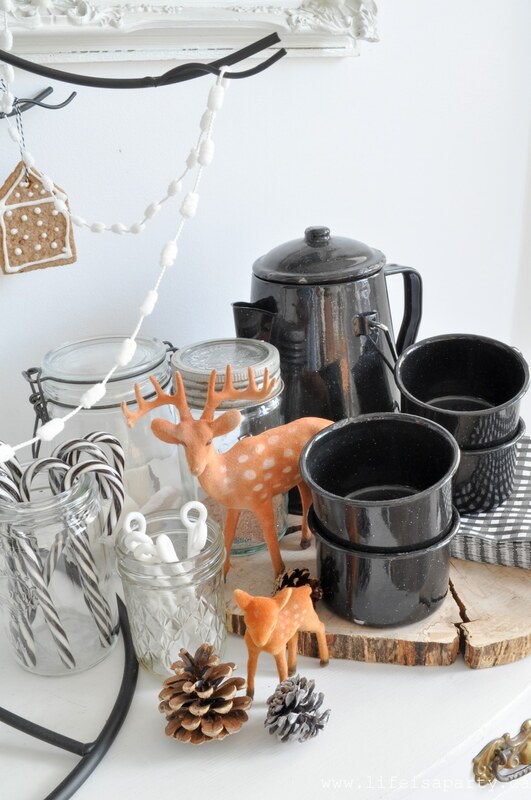 This year my Christmas decor is all about black and white, nature, a rustic Scandinavian feel, and buffalo check. 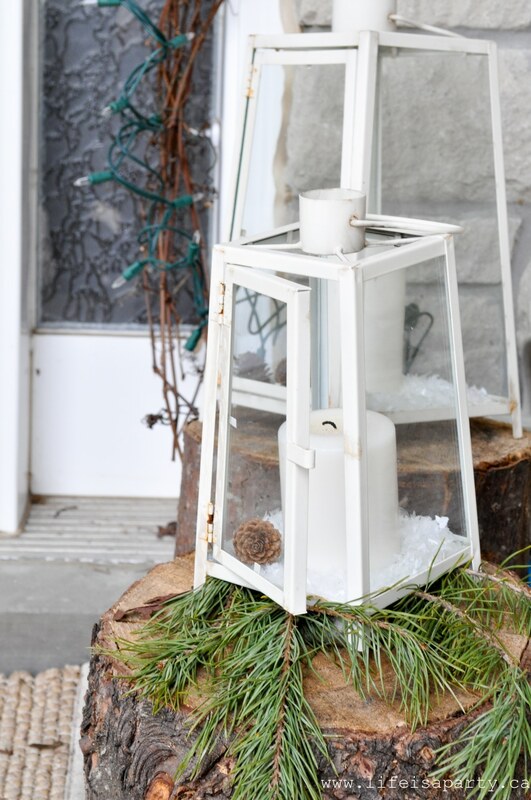 Check out lots more decorated Holiday Homes at Jennifer Rizzo’s Holiday Housewalk Link Party 2017. 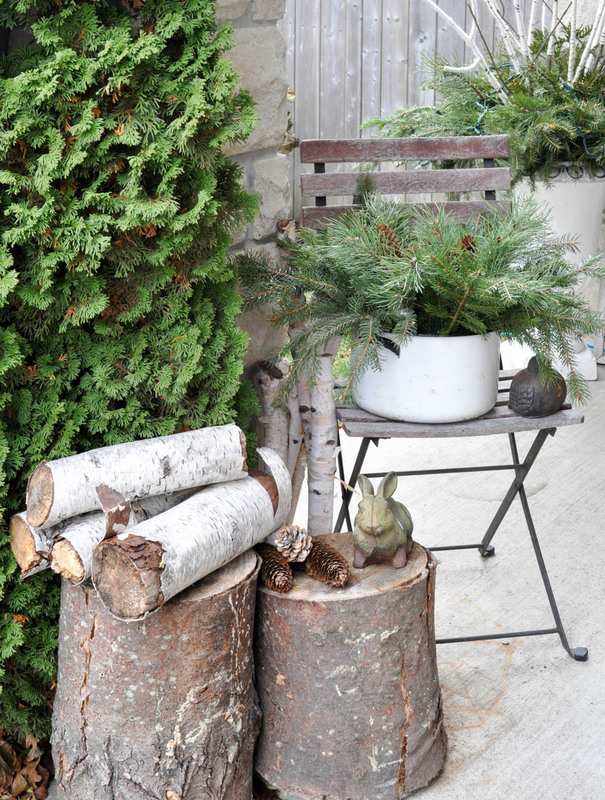 Outside, there’s a collection of foraged greens and stumps. 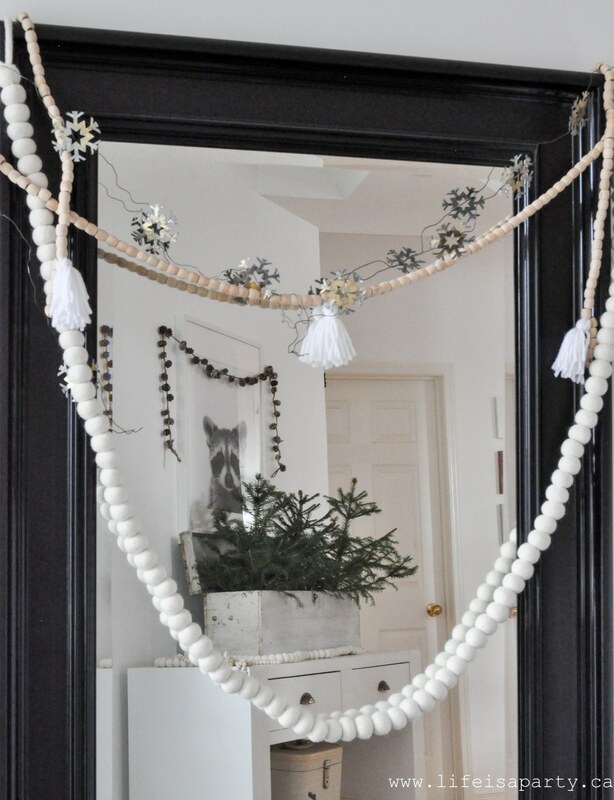 I wanted a cozy feel too, so I used my pom pom garland and yarn wrapped twigs too. This big mirror is in our entrance way and its reflection offers a glimpse of what’s inside. 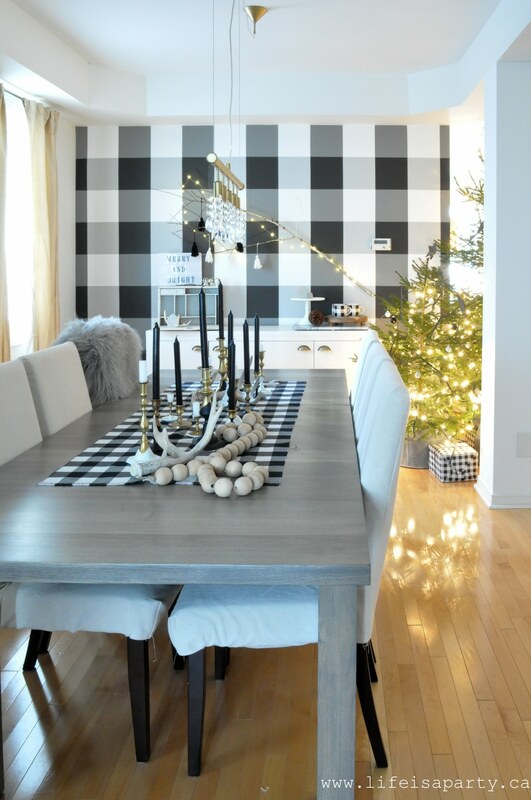 This year in the dining room, I decided to add a little drama with a buffalo check feature wall. I worked with Para on this project, and I’m looking forward to sharing all the details of how to create it with you in January. It was my daughter Maddie’s idea, and then I looked for inspiration on how to do it on-line. Be sure to check out my friend Thalita’s version at The Learner Observer. I love the buffalo check wall, and it really wasn’t too hard to create either. 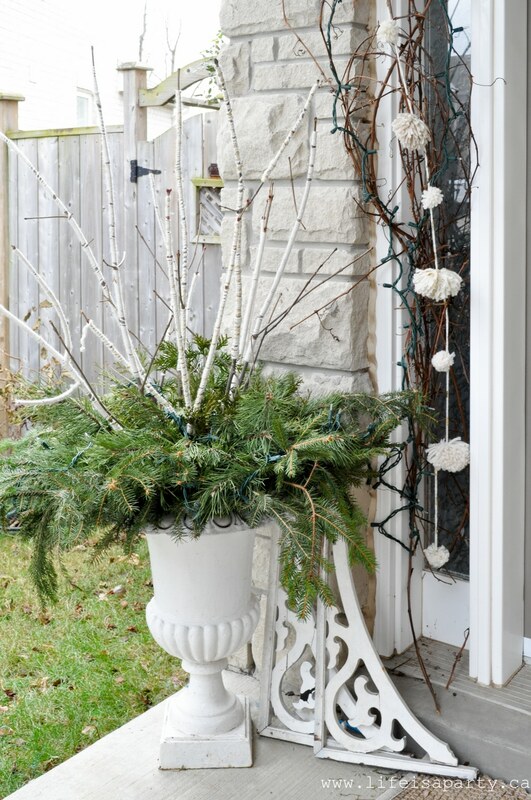 Just inside the door is this little console table, and I’ve added my vintage white tool box full of mini real trees. I love how simple it is. And of course, my racoon is looking pretty at-home in this little forest! 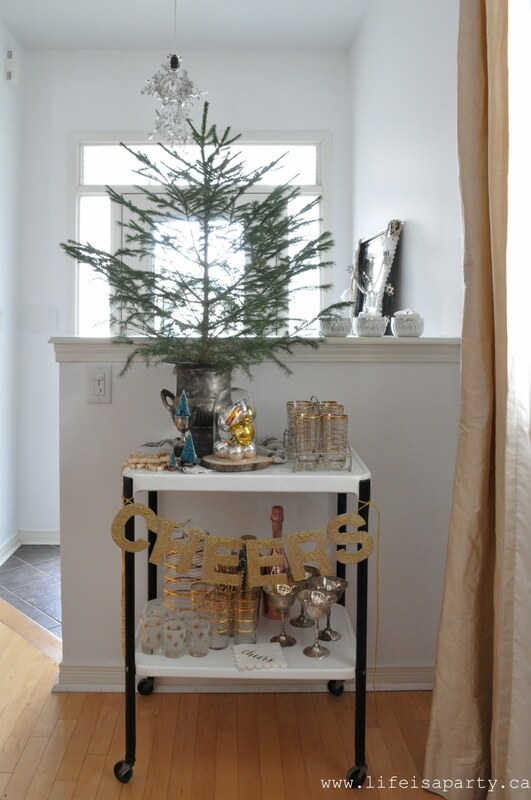 And over on my little bar cart, another pretty real tree. This one is nestled into my vintage silver ice bucket. 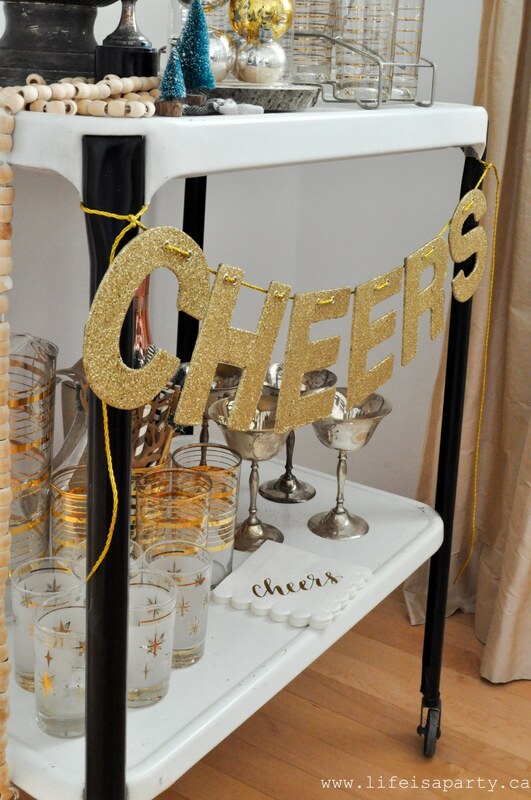 There are lots of vintage treasures on the bar cart. I love collecting at antique fairs, and stores, and thrift shops. The trophy is a recent acquisition, and it couldn’t be cuter holding a bottle brush tree. I had fun decorating the dining table with some brass candlesticks I’ve collected. 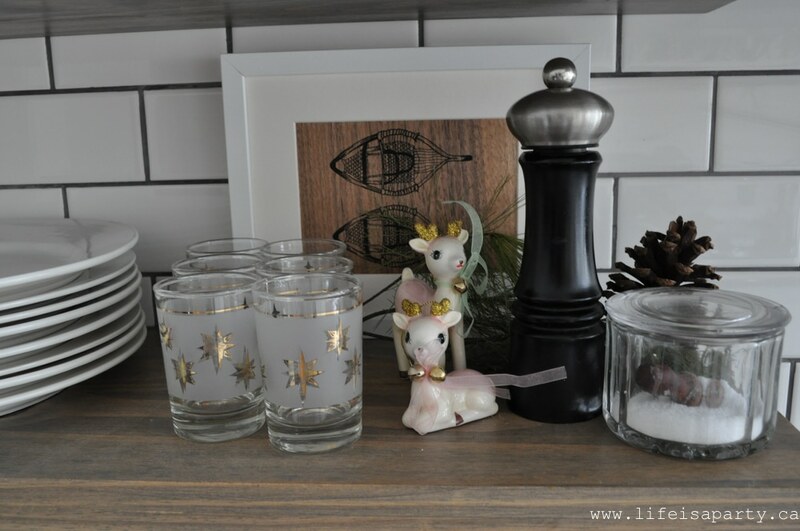 They’ve had a bit of a makeover with a paint dip effect –see how I did it here. I love the addition of the black and white for a modern feel. The table runner is just a piece of fabric, I didn’t even finish the edges because I kind of liked the rustic feel, and think it will only look better as the edges fray more. 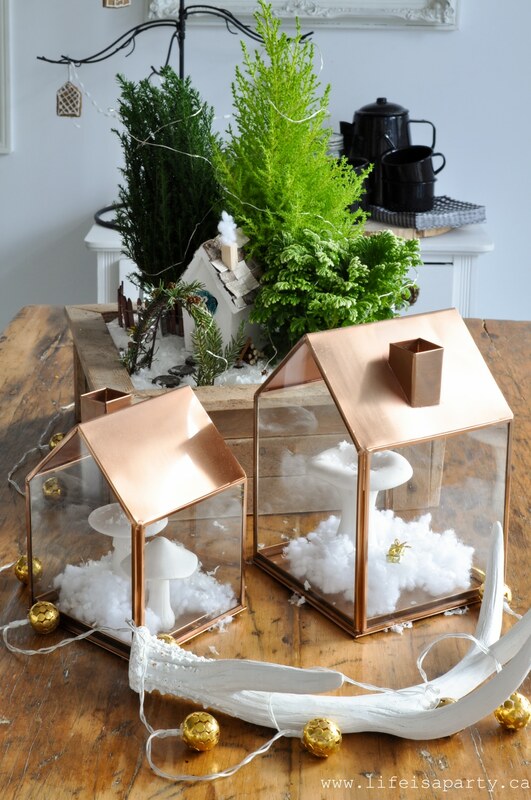 Especially around Christmas, I love the idea of bringing the outdoors in. 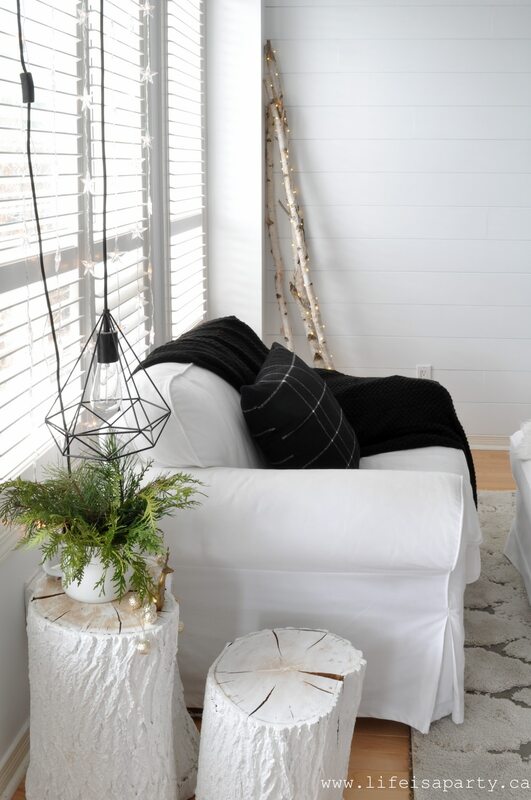 This year I added in a pretty birch branch to my feature wall with a few pretty lights and some homemade black and white tassels. 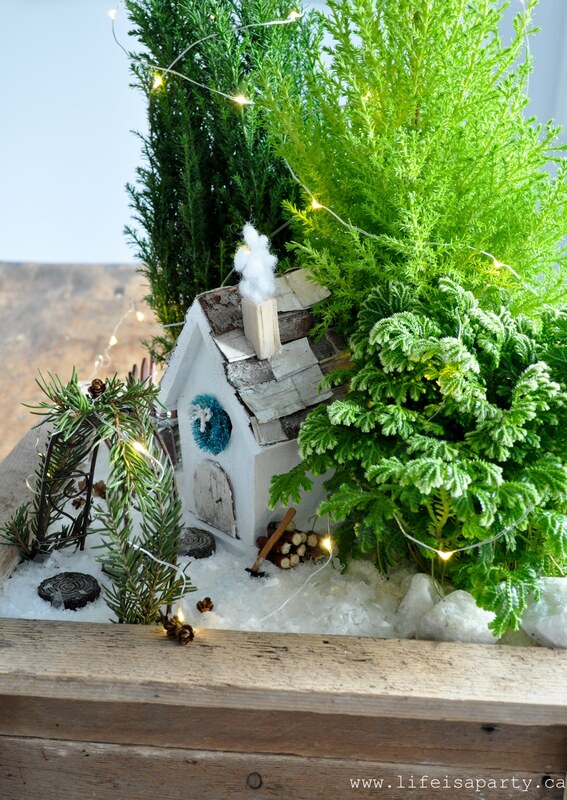 My favourite part just might be the little forest of Christmas trees. I cut one papa tree, one mamma tree, and one baby tree. The vintage galvanized tubs are hiding the tree stands. I love their rustic charm. I’ve decorated them in black and white, with some metallic and I love how simple and Charlie Brown they are. I also love that they’re grouped between the dining room and the living room, so we can enjoy them from both rooms. In the livingroom I’ve continued the black and white and I love it. 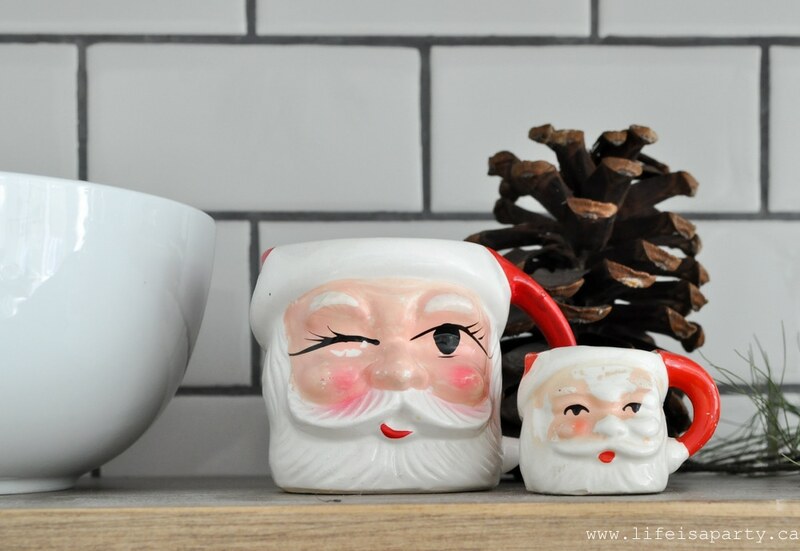 I’m excited to be decorating for Christmas in the living room and kitchen for the first time since their makeovers in the last two One Room Challenges -see the living room before and after here, and the kitchen before and after here. I kept the fireplace really simple. The tufted chair and beautiful authentic mud cloth pillow are both from Wayfair. The pillow has the loveliest texture. 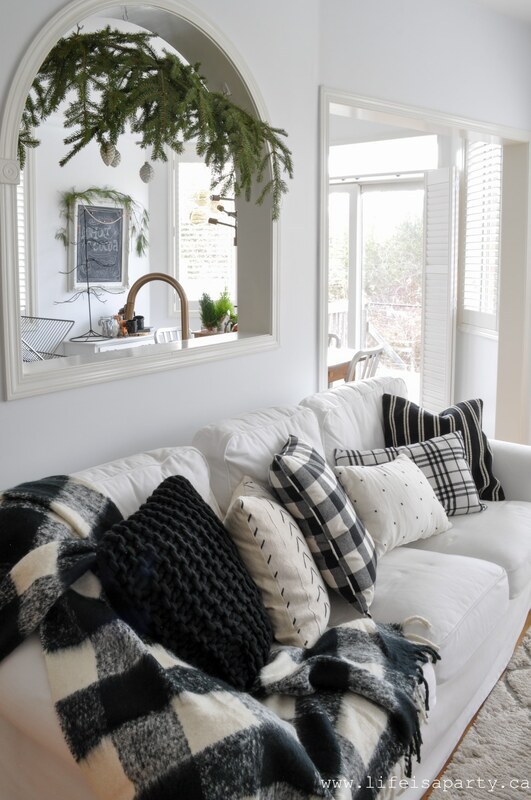 I think my favourite part of this black and white colour scheme was finding all the perfect pillows for the couch -including the white mud cloth pillow. 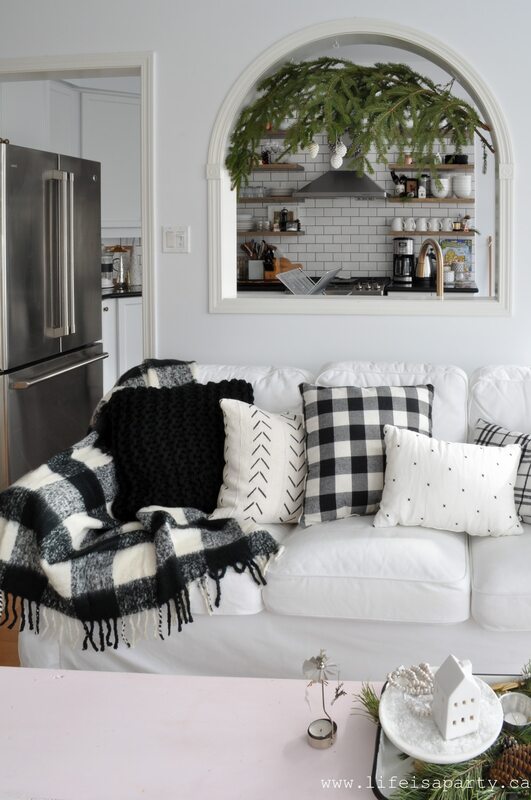 I love the mix of textures, and prints all brought together by the simple colour scheme of black and white. 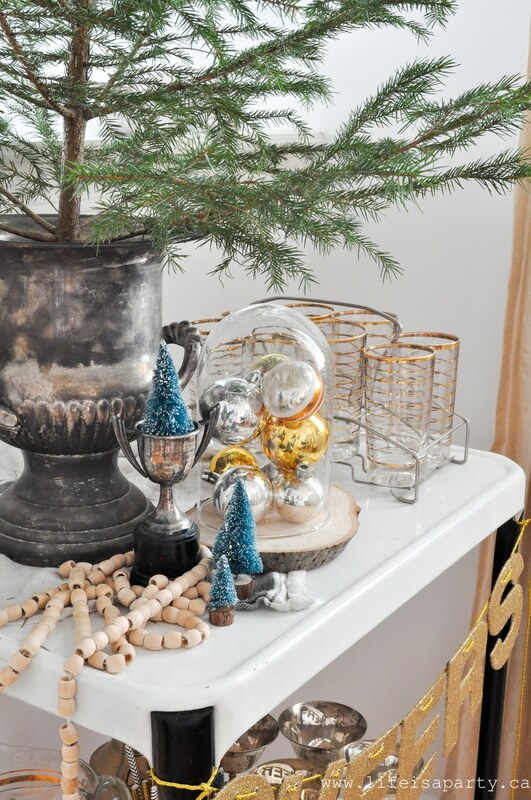 For a touch of holiday, more natural elements like birch and fresh greens. My little side kick Oscar wanted in on the fun, and it felt like he was posing for this picture. He’s our adorable Havanese puppy, just 1 1/2 and an amazing addition to the family. This room feels so cozy. 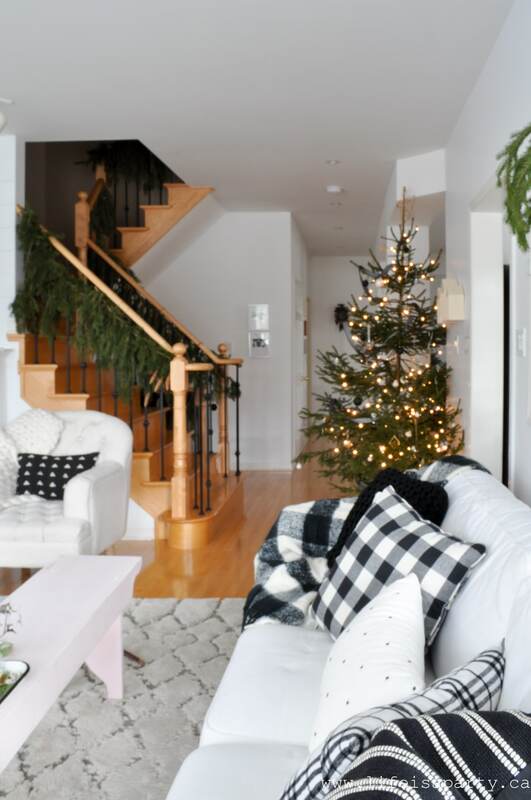 Although black and white might not be traditional Christmas colours, they really do feel so relaxed and easy to live with. And all the greens definitely make it feel Christmas-y. 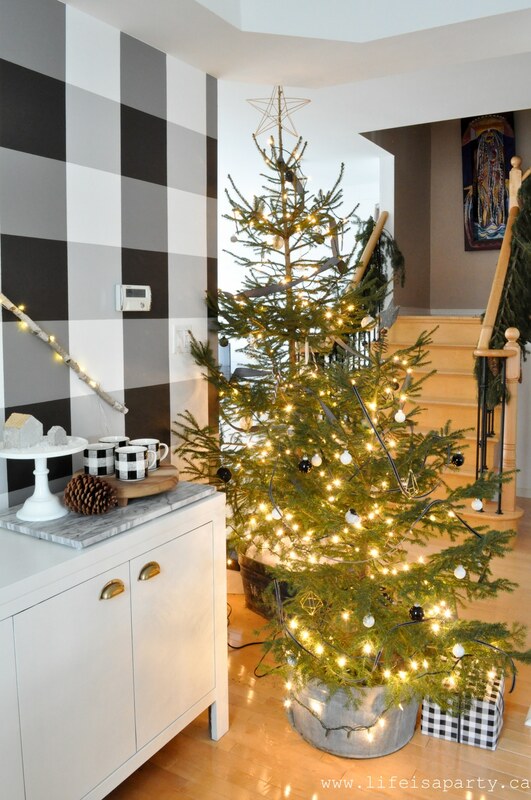 The stairs are dressed with simple evergreen boughs. I normally make garland for the stairs, but these are whole branches. They were perfect since they were growing in this downward way. And I love all the pinecones that were already attached to them. The living room leads into the kitchen. I’m so excited since we just finished redoing it a few weeks ago and I love cooking in it. We’ve started our Christmas baking and it’s a pleasure to cook in. I’ve added some greens and a few little Christmas touches to my open shelves. Here’s to lots more Christmas baking. Looking back through the pass through, this pretty evergreen bough adds a festive feel. And our little eating area got dressed up for Christmas too. On the table is my little Christmas fairy garden along with a couple pretty copper house lanterns from last year with some fairy mushrooms in them. 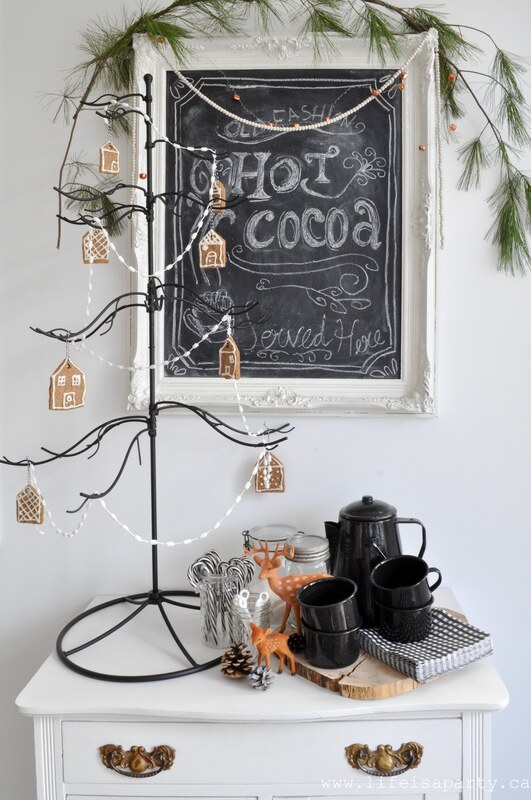 And on the little side cabinet we set up a sweet hot chocolate bar. My 10 year old daughter did the pretty chalkboard art. The hot chocolate bar is stocked with all the essentials. Thanks so much for joining me for a little tour of my main floor all decorated for Christmas. 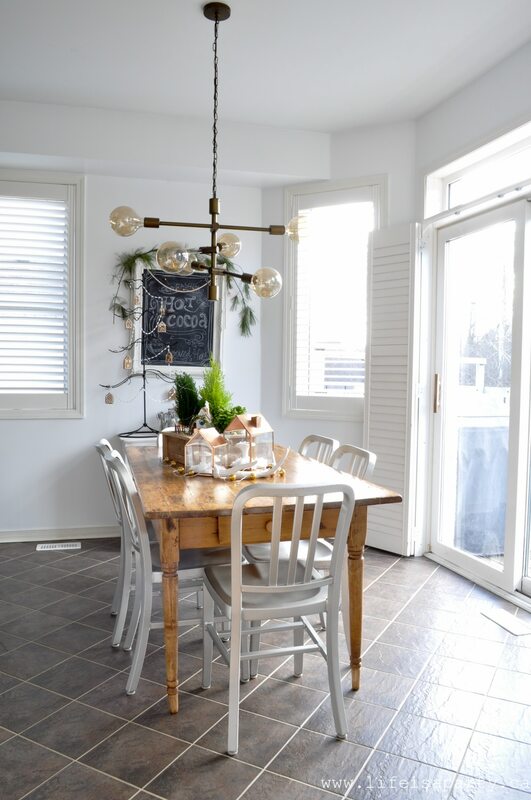 Your dining room feature wall turned out beautifully! 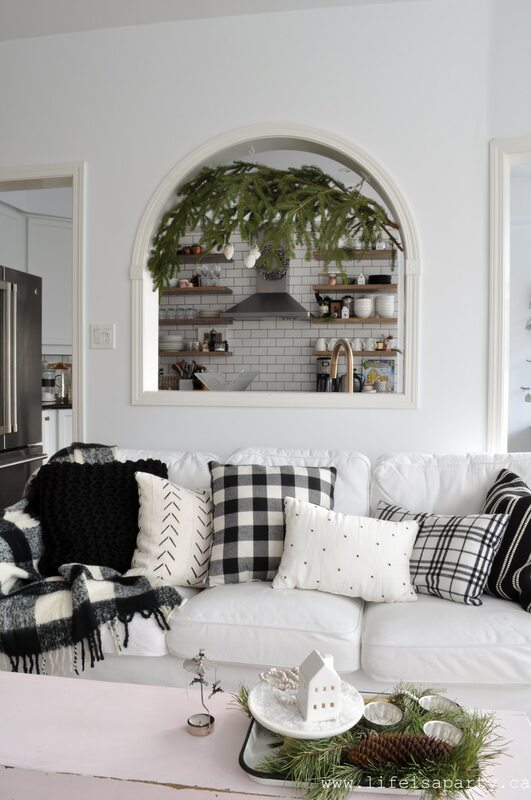 What a wonderfully cohesive theme you have throughout, with the black, white and greenery. I envy your forest of trees. I would like more trees but we got ours at the tree farm for $60 so I wasn’t about to get a few, haha. Have a wonderful Christmas! Great tour Dannyelle, love all the buffalo check! 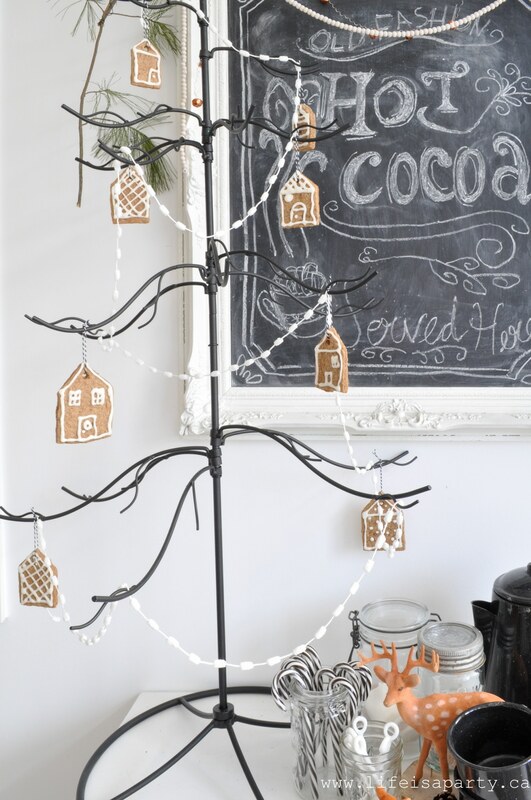 Cozy and creative! 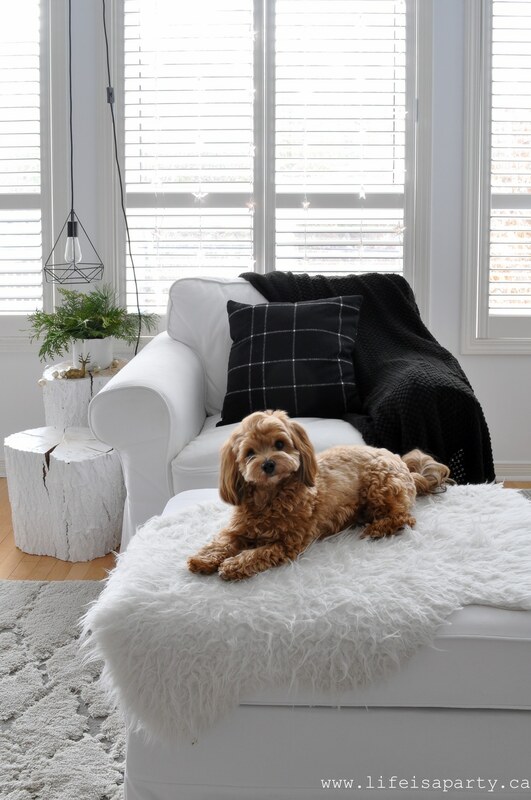 Such a beautiful home tour Dannyelle!! You have so many gorgeous rooms to show off, and I LOVE the black and white colour scheme 🙂 Beautiful tour! Oh my gosh, your home is like buffalo check heaven! I love it! What a beautiful Christmas home Dannyelle! 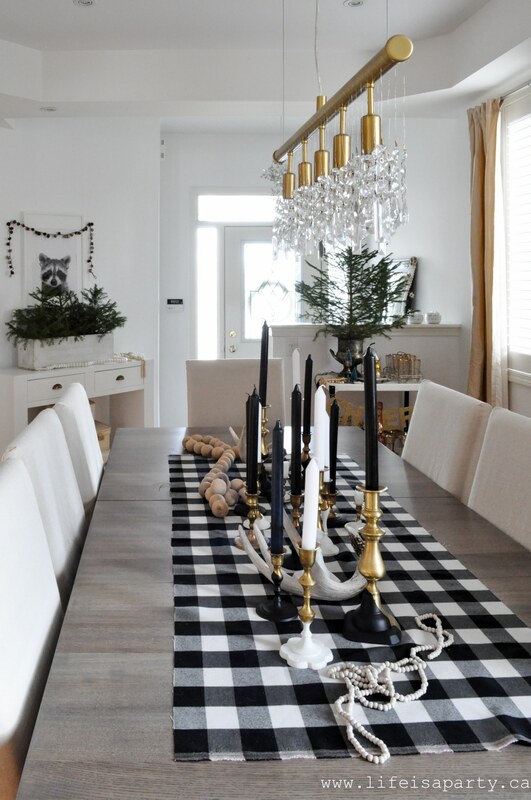 I love the black and white with the greenery…it’s so fresh and pretty! 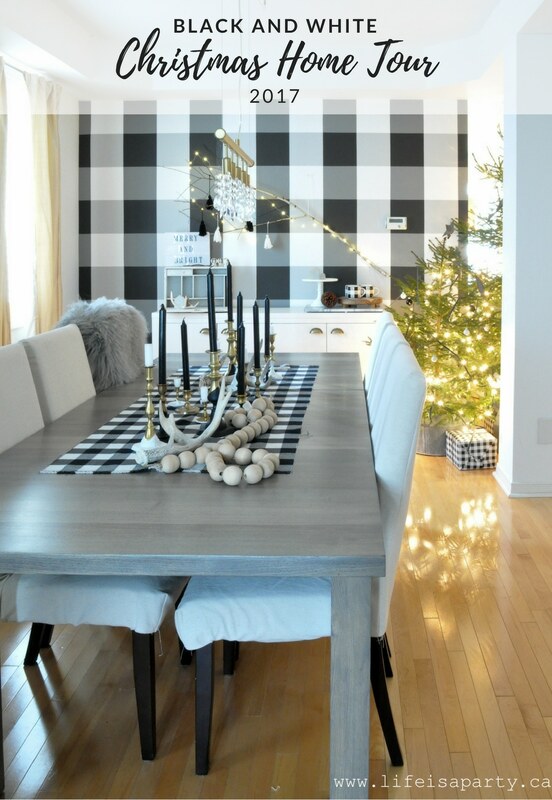 But your dining room feature wall is ah-mazing!! What a gorgeous statement wall!! I just love it all! 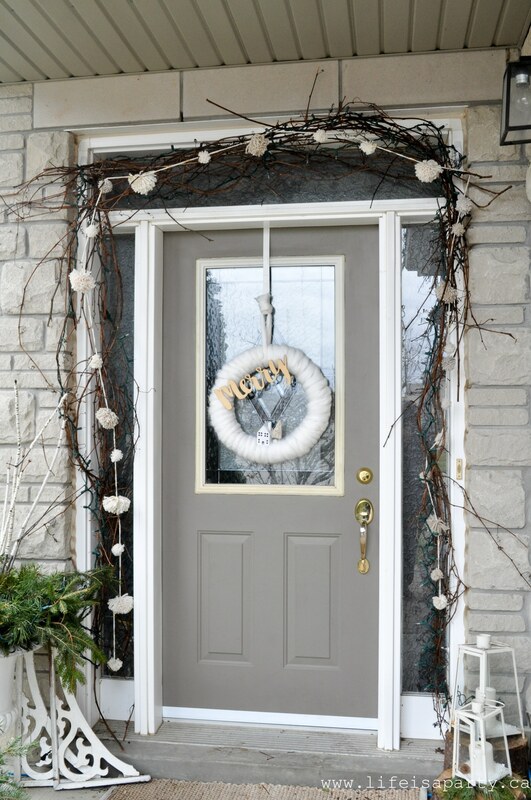 The pom pom garland around your front door is super cute and I love those sweet gingerbread house ornaments. 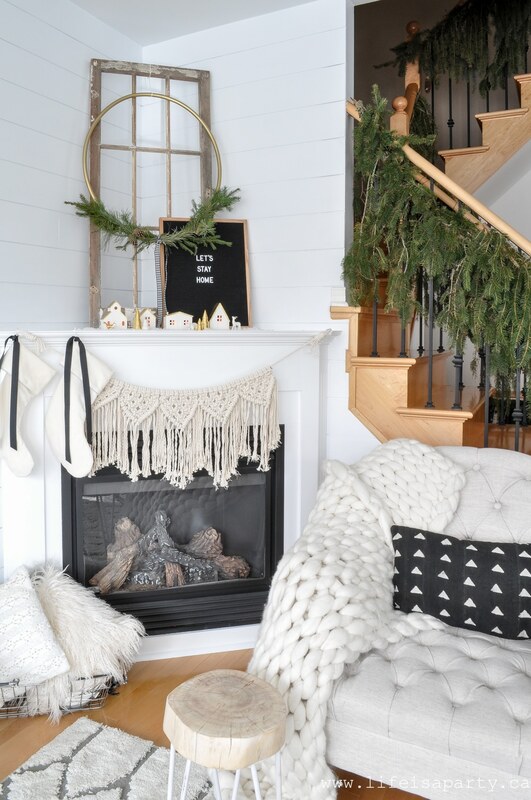 Such a cozy space to celebrate the season! Your house is GORGEOUS! 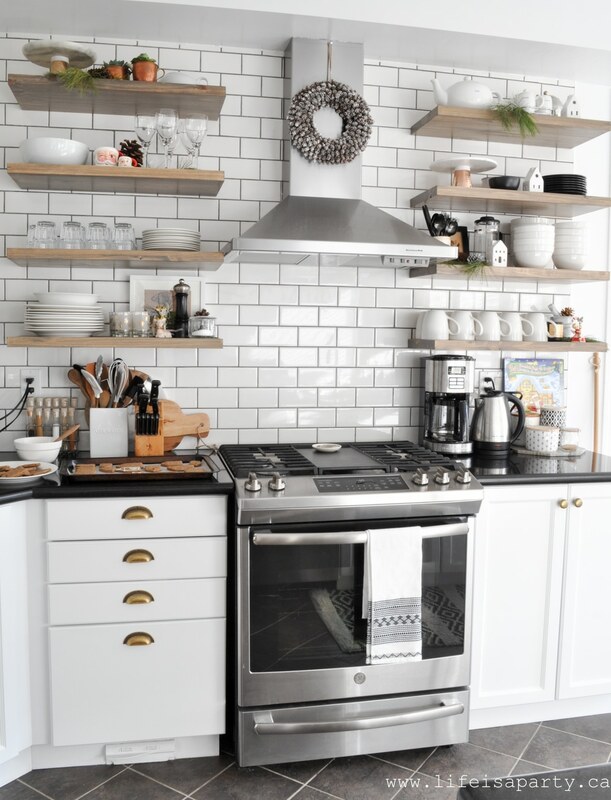 I love all the black & white and neutral rustic touches. You did such a great job. What a beautiful Tour! The black and white is wonderful with the greenery! 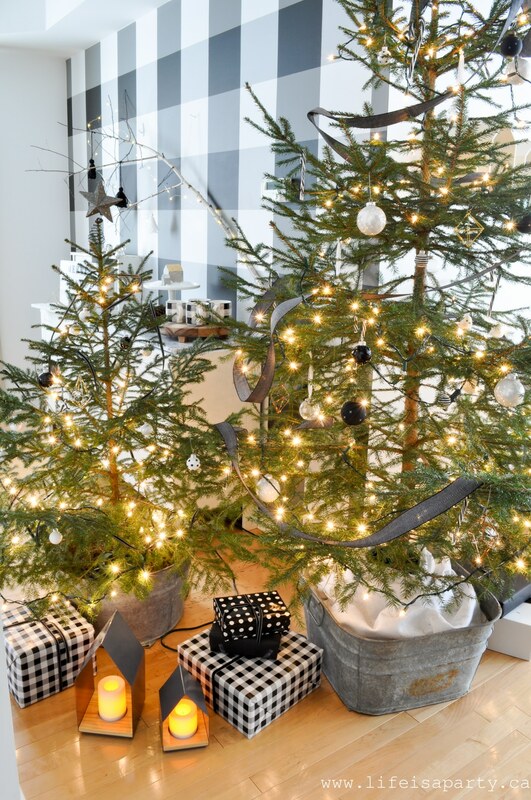 I am inspired to put a tree in a champagne bucket now! 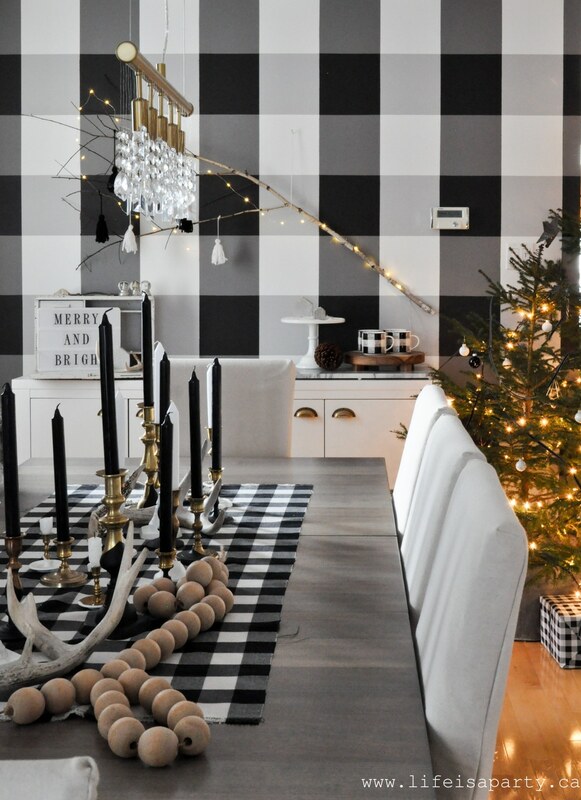 Everything looks so crisp and clean with your B&W colour scheme – perfection! 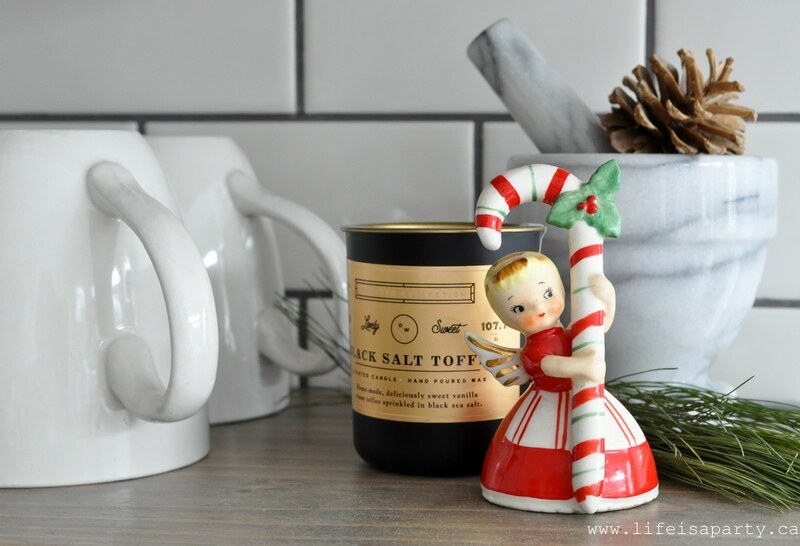 I love the Kitchen renos because the little pops of red agains the subway tile are beautiful. Happy holidays! Beautiful home & Christmas decorations. Loved your little dog Oscar. We adopted a dog from the shelter and I am not certain now she is a Havanese too. She looks so much like Oscar just a little lighter color. Everything is so layered and lush feeling! Of course I love your vintage touches and the beads. I’m loving swags of beads this year! Oh Dannyelle! The details are all so wonderful! 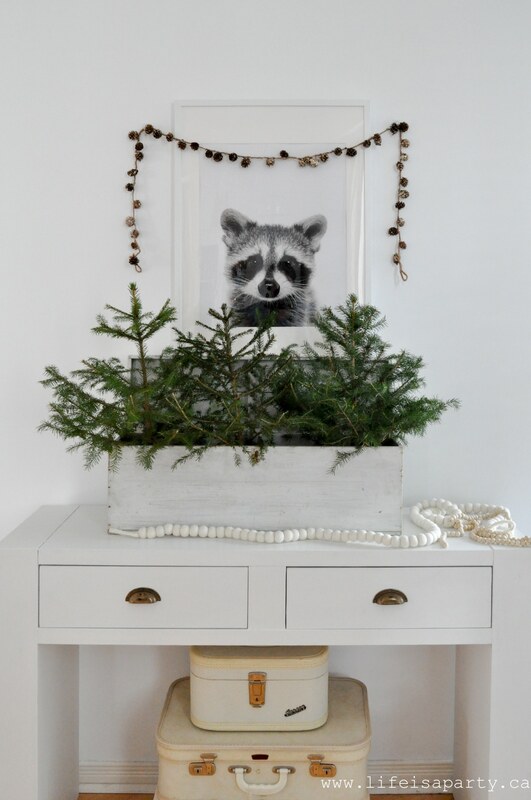 I am madly in love with your simple vignette with Mr. Racoon, that is just the sweetest – I may have pinned that one too many times! 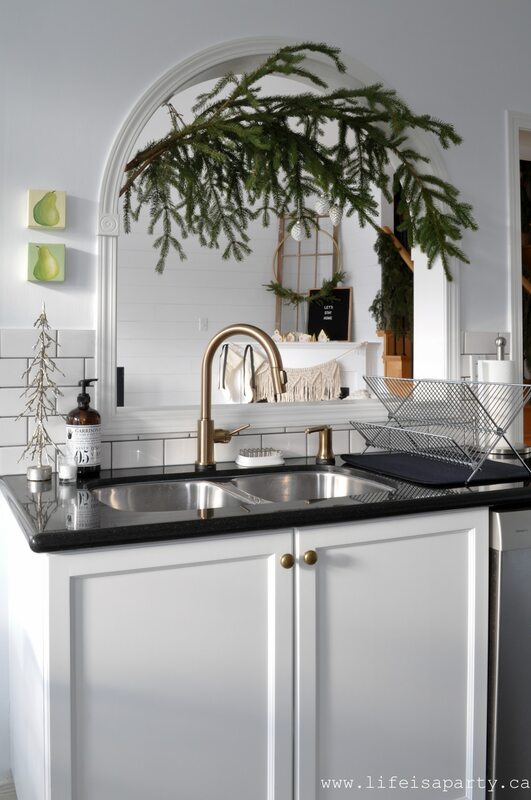 your forest, the black and white THAT kitchen!!! Your vintage touches all of it is perfectly festive, I adore the bottle brush tree in the trophy, I’m off to do that right now! <3 You can have more than one favourite thing, right? 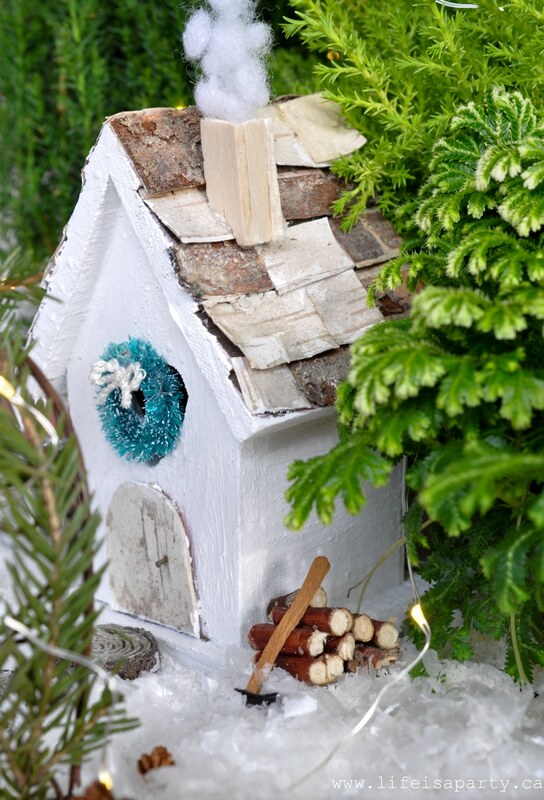 PS the puff of smoke out of the fairy garden chimney made me say awwwwwwww I can’t wait to read your post on that! Dannyelle, Love the simple black and white with touches of colour! 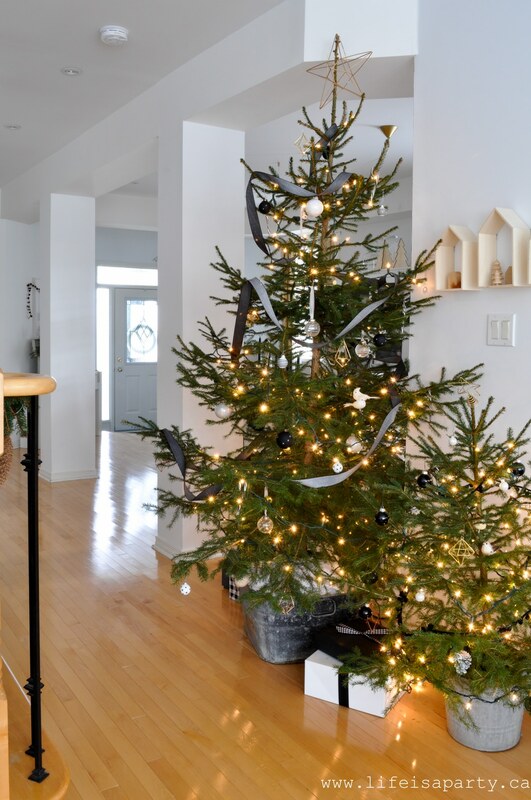 I can tell you’ve put a lot of thought and effort into decorating your home for Christmas with attention to detail. Beautiful! Seriously amazing. 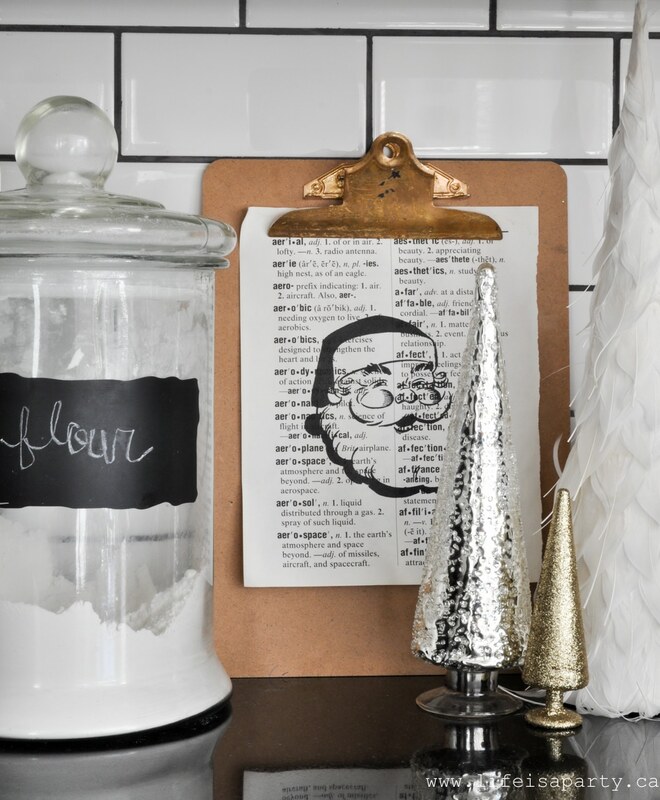 I am totally swooning over your crisp black and white Christmas decor. That wall! All the pops of black against the white. 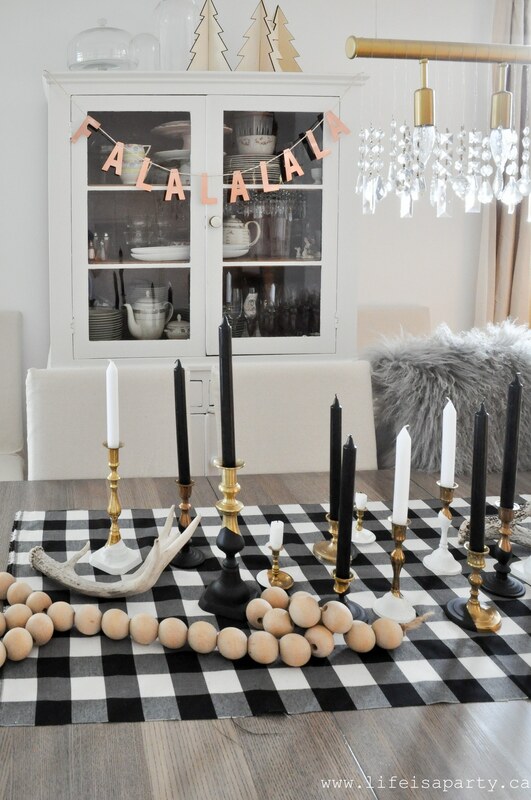 So lovely and scandi-chic ish. So many beautiful vignettes and images!! Fun to be on this tour series with you! Thanks so much Gloria, wishing you and your doggie a Merry Christmas! Linda, thanks so much! And, Merry Christmas! 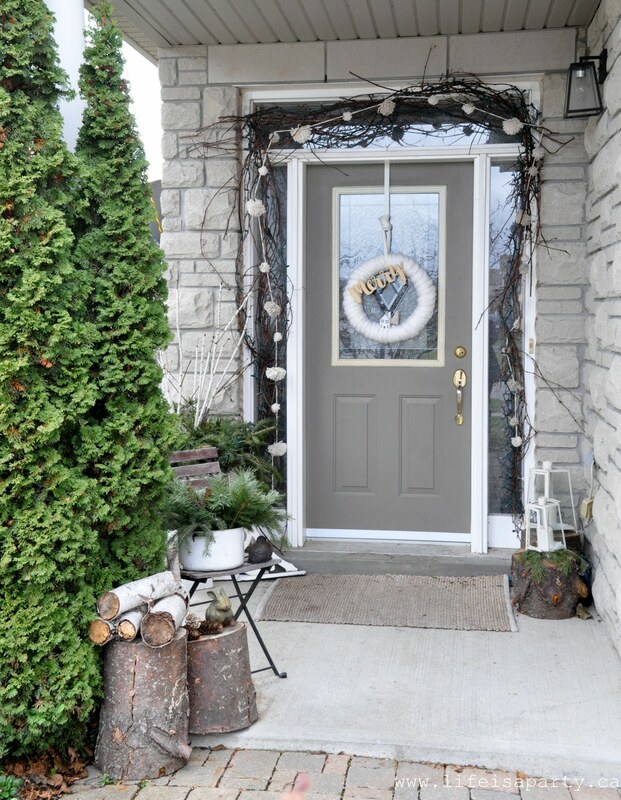 Wow, you had me at yarn-wrapped twigs on the front porch! Love your eclectic style!